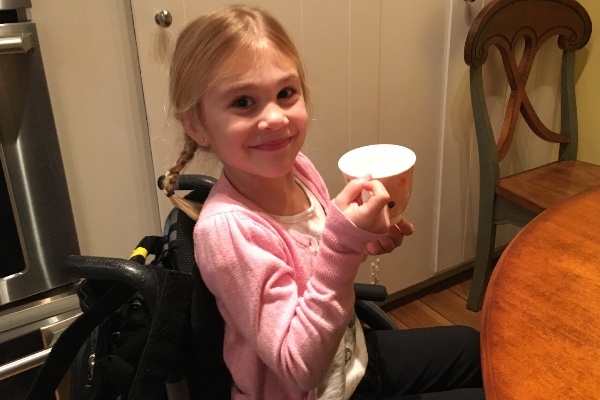 PALOS VERDES PENINSULA, Calif. — A 5-year-old California girl was paralyzed from the waist down after performing a backbend in on her living room floor. The injury left the budding ballerina paralyzed from the waist down, but her family says Eden's spirit has never wavered. "Because of Eden's spirit and resiliency, we have never lost hope in her full recovery," her mother Kylee Hoelscher wrote on the girl's GoFundMe page. Anyone who encounters Eden, including doctors, nurses and therapists always have the same response: "If anyone can recover from this, it's Eden." Eden’s bowels and bladder do not function anymore and her body cannot regulate its own temperature, her mother said. “The damage, it’s her entire spine and it doesn’t make any sense at all. It’s just a backbend and it’s just devastating. You go from watching your 100 percent independent kid who dressed herself, put her hair in a ponytail to not being able to get out of bed and it’s almost impossible to bear,” Kylee Hoelscher told ABC. Eden earned the nickname “Daredevil Eden” from her physical therapists because of her determination to overcome her injuries, her mom wrote.